4. Baby’s blood pressure control and heart rate control are damaged by smoke exposure during pregnancy, due to smoking by pregnant mother, father and/or anyone else nearby. This may explain why such babies’ risk of cot death or sudden infant death syndrome (SIDS) is higher. 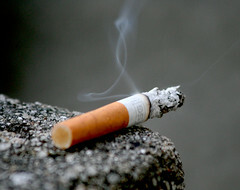 Health experts consider maternal smoking as one the biggest risk factors of SIDS.